Soil Festival 2018 is right around the corner. Click here to register! Soil Festival 2018 is just weeks away, and we’ve got some great activities in the works! Each week, we’ll share what’s new. This year’s festival will be held at Truly Living Well’s Collegetown Farm on Saturday, May 5 and will feature cooking demonstrations, educational workshops, a kids corner, and much more, including a variety of exhibitors. These experts will be on hand all day to share their knowledge and answer your most important questions. The mission of the American Community Gardening Association is to build community by increasing and enhancing community gardening and greening across the United States and Canada. Stop by the booth to learn more about the association and their upcoming conference. Do you have general garden questions or questions about your garden’s soil? Come talk to soil and garden experts! Bring soil samples for Jason Lessl from the UGA Soil Lab in Athens for complimentary basic soil nutrition testing. Click here for step-by-step instructions on collecting your soil sample to bring for your test. Stop by CompostNow’s booth to learn about their weekly collection service of food scraps and compostables for households and businesses across Atlanta, to be turned into compost for local community gardens and urban farms. Come learn from the experts at the Environmental Protection Agency Region 4 office about bees and other pollinators, how to read water quality test results, and choosing safer "green" products. Stop by the PeachDish booth to learn how to get fresh ingredients delivered from the farm to your door. You can have your soil tested for free at Soil Festival 2018! Click here for step-by-step instructions on collecting your soil sample to bring for testing. The soilSHOP is hosted by the Georgia Department of Public Health, in partnership with the Agency for Toxic Substances and Disease Registry and the Environmental Protection Agency. The soilSHOP will offer free lead soil screenings with same-day results and explanations on screening outcomes and ways to reduce potential exposures to lead in soils while gardening or playing in yards. Click here for step-by-step instructions on collecting your soil sample to bring for your lead screening. Stop by the Super-Sod booth to learn more about their products, particularly their organic compost: Soil3. If you’re a community or school garden, be sure to sign up to receive the application to have a cubic yard of Soil3 delivered right to your garden! Learn more about the farm that hosts Soil Festival each year and their upcoming events and programs! The mission of the Fulton County Cooperative Extension Service is to respond to citizens’ needs and interest in agriculture and natural resources, families, 4-H and youth through education and information. Come meet your Fulton County Extension Agents! We've got tips to improve your soil, information about our pollinator parntership, and you can learn about the type of programs we support. For students and children, we'll have scientist trading cards (produced by USDA-US Forestry Service) and a Mighty Mini Microbe coloring book (crayon packets provided by Fulton County Soil and Water Conservation District). 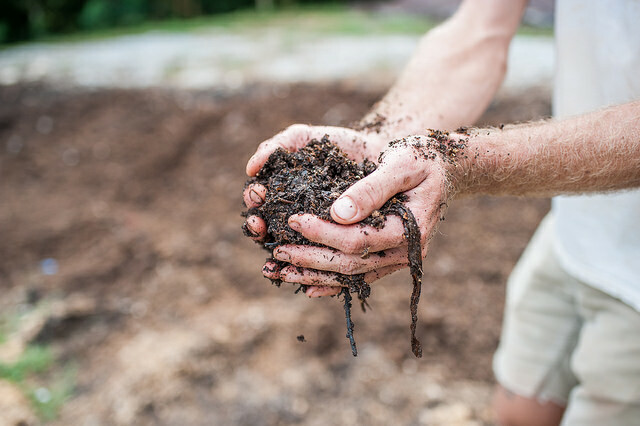 Vermicomposting is the process of harnessing the power of worms to make compost. Stop by this booth to learn more about vermicomposting and how to make your own vermicompost bin. Stay tuned for info about additional exhibitors. Register for Soil Festival today!